It is a legal tool that allows the Canadian government to detain and deport permanent residents or foreign nationals considered to be a security threat using secret evidence that the accused is not allowed to see. The certificate's use is outlined in the Immigration and Refugee Protection Act. What's the process for issuing a certificate? The minister of Citizenship and Immigration and solicitor general co-sign the certificate indicating the person is inadmissible to Canada on grounds of "security, violating human or international rights, serious criminality or organized criminality." Foreign nationals who are the subject of a security certificate are then automatically detained, while permanent residents may be detained on a case-by-case basis. A Federal Court judge views the evidence against the person, then determines whether the certificate is reasonable. The accused and their lawyers don't get access to all the evidence against them, only a summary decided upon by the judge, who cuts any information deemed to be detrimental to national security or the safety of any person. If the Federal Court decides that the certificate is unreasonable, it is quashed. If the court decides that it is reasonable, the certificate becomes an order for removal of the person. The court's decision can't be appealed. Almrei, a Syrian-born refugee, had been in custody since October 2001, after CSIS accused him of links to al-Qaeda. He was freed to a strict house arrest in January 2009. A federal judge then struck down the security certificate, essentially freeing Almrei in December 2009. The Morocco-born permanent resident was arrested in May 2003 on suspicion of links to al-Qaeda. Two years later, he was released on tight bail restrictions. The Montrealer is a teacher and father of three. 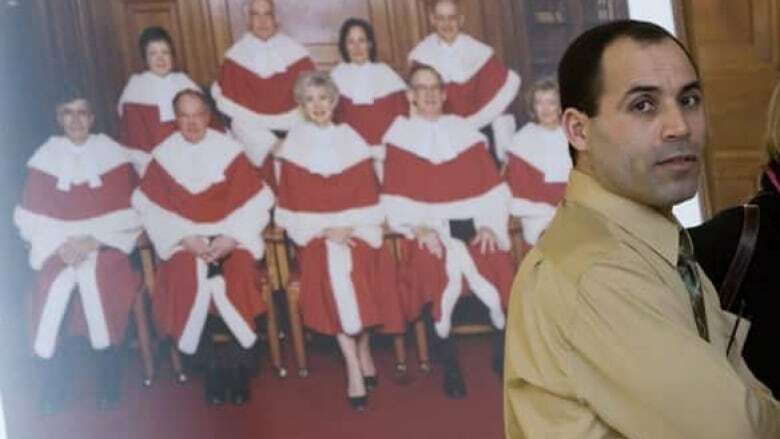 An Algerian refugee living in Ottawa, where he worked as a gas station attendant, Harkat was arrested in December 2002 and held for 3 ½ years before release on bail in June 2006. The Egyptian-born man was released from custody in 2007 after being held for six years. He was teaching at a Muslim school in Toronto when arrested in 2001 over alleged links to Egyptian terrorist group Al Jihad. It was the second time he was arrested on a security certificate. The first was in 1999, but was quashed. Also an Egyptian, he's accused of links to al-Qaeda leader Osama bin Laden. The Federal Court ordered his release in early 2007, nearly seven years after Mahjoub's arrest on a security certificate issued in May 2000. On March 18, 2009, however, a federal court judge returned him to custody upon Mahjoub's request, which was in protest against his "oppressive" bail conditions. When were security certificates first used? The certificates have been part of Canada's immigration law since 1978. Since 1991, at least 29 security certificates have been issued -- including two for terror suspect Mahmoud Jaballah. Ernst Zundel, a German-born landed immigrant who denied the Holocaust, was also among those deported under a security certificate. The latest use was in November 2006 in the arrest in Montreal of an alleged spy, who went by the name Paul William Hampel. The legal tool came under increased scrutiny after the arrests of alleged terrorists in the post 9/11 period. Part of the controversy stemmed from the fact that the accused ended up in indefinite legal limbo since they potentially faced torture if deported home. The plight was highlighted by five men -- dubbed the Secret Trial Five -- facing deportation to Morocco, Algeria, Syria and Egypt where they risk torture. The five men are Hassan Almrei, Adil Charkaoui, Mohamed Harkat, Mahmoud Jaballah and Mohammad Mahjoub. The process has come also under repeated criticism from international and domestic human rights groups, who argue it violates basic principles of justice, because the accused are denied access to evidence against them and indefinitely detained. The $3.2-million Kingston Immigration Holding Centre was built on the grounds of the Millhaven Penitentiary in Bath, near Kingston, Ont. It opened its doors in April 2006, taking in four of the five terrorist suspects who were subject to security certificates. The building can house a maximum of six people, and is operated by the Correctional Service of Canada on behalf of the Canada Border Services Agency. Federal documents unearthed in 2008 showed that the facility's annual operation costs are an estimated $2 million, no matter how many detainees it houses. The special facility was built after criticism about the living conditions at the provincial facilities where the suspected terrorists were previously housed. On Feb. 23, 2007, the Supreme Court of Canada unanimously voted 9-0 that the security certificate system was unconstitutional, but suspended judgment for a year so that Parliament could draw up a new law that included a better review process to protect the interests of detainees. Lawyers for lead litigant Charkaoui and two other detainees -- Harkat and Almrei -- had argued before the court that security certificates locking people up without charge violated both Canadian and international law. Federal government lawyers argued they were necessary for national security. The detainees brought the case to the Supreme Court after the Federal Court of Appeal ruled on Dec. 10, 2004, that security certificates were constitutional. It ruled that non-citizens and permanent residents can be subjected to a different standard of legal treatment than citizens. The judges also upheld the use of secret evidence, and said that authorities have an obligation to suppress evidence if its release might harm national security. The Federal Court of Appeal decision upheld a December 2003 ruling by the Federal Court. A new bill was passed in early 2008 to improve bail procedures and permit special, security-cleared lawyers to act as "special advocates" for the accused -- allowing them to attend the security certificate hearings, challenge government evidence and generally protect the rights of the accused. The "special advocate" system is similar to the British model. Some critics say the system is still unconstitutional and expect it to be challenged. In 2004, Britain's highest court -- the House of Lords -- ruled 8-1 that the government can't detain foreign suspects indefinitely without bringing them to trial. Nine Muslims launched the appeal after being held at Belmarsh prison for nearly three years under the Anti-Terrorism, Crime and Security Act. The law had been drafted after the 2001 al-Qaeda attacks in the U.S., and required Britain to opt out of sections of the European Convention on Human Rights. But the House of Lords ruling quashed that opt-out order when it rejected the government's case that indefinite detention was necessary to prevent extremist attacks. In response to that portion of the law being struck down, the British Parliament passed the Prevention of Terrorism Act in March 2005, which replaced indefinite imprisonment with "control orders," a form of house arrest under which suspects have restrictions placed on their movements and must report daily to a police station. The Terrorism Act of 2006, passed after the July 7, 2005, bomb attacks in London, extended the amount of time terror suspects could be held without charge from 14 days to 28 days. The original plan was to extend the limit to 90 days, but that was defeated in Parliament.